A switch in venue and re-signing of a major sponsor ensures the 2017 Women’s Australian Open will again draw some of the world’s best women golfers to South Australia. Golf Australia last week revealed the 2017 Open would be played at the storied Royal Adelaide Golf Club from February 16-19 and former winner, world No 1 Lydia Ko, as well as defending champion Haru Nomura have already committed to play. Further exciting news was the revelation that Dr Haruhisa Handa, through ISPS director Midori Miyazaki, confirmed an eighth consecutive year of naming rights’ sponsorship, meaning the event will again be named the ISPS Handa Women’s Australian Open. “Dr Handa and the International Sports Promotion Society were thrilled with the event’s reception in 2016 and we believe that, and our long-standing relationship with Golf Australia, strongly contributes to our message about the power sport has to inspire, especially to those less fortunate,” Miyazaki said. Golf Australia chief executive Stephen Pitt said securing the signatures of key players like Ko and Nomura early in the year would also prove a real boon for all parties involved, as well as helping to attract other big names. “Lydia’s name is the hottest in world golf and we are thrilled she has committed to again play in Adelaide – she had a great time in February at The Grange and her eagerness to spread the word and return is pivotal,” Pitt said. 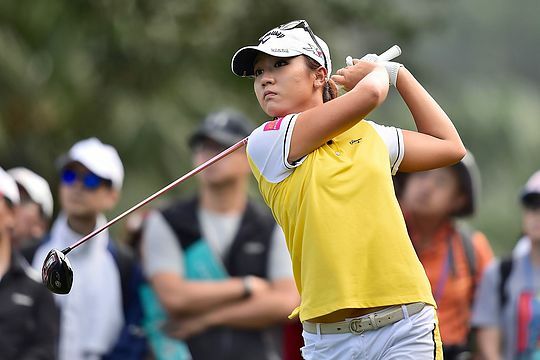 “Haru vaulted to prominence with her maiden LPGA Tour win at The Grange and she hasn’t put a foot wrong since, winning the Swinging Skirts Classic in San Francisco to continue her charge up the Rolex Rankings.